For a lovable animated feature film about talking anthropomorphized animals and the human-like civilization they inhabit, Zootopia feels as urgent and politically timely as a year’s worth of Frontline documentaries. It’s a subtly forceful allegory of warning against the destructive consequences of prejudice and racial profiling (even if it often wants to have its ethno-cultural stereotype cake and eat it too) that only gains resonance in the face of the election of a U.S. President who cynically utilized those forces for his benefit. It mouths the words of conventional “anything is possible” American Dream messaging while actually feeding off the social justice currency of the Ferguson, Missouri protests and Black Lives Matter, as well as rising resistance against sexism and the divisive, fear- and power-driven political cleavages of a polarized America. Since Zootopia is a movie of that polarized America, its perspective on its richly-imagined setting – an urbanized neoliberal technocratic capitalist society of human-like animals – is necessarily filtered through the culture’s preferred (though hardly uncontroversially so) heroes: the police. Judy Hopps (voiced by Ginnifer Goodwin) is a rabbit from a rural town who is unwilling to continue in the family carrot-farming business with her hundreds of siblings. Judy is blessed/cursed with a grand sense of idealism, and her overriding dream and ambition is to move to the great animal metropolis of Zootopia, which she envisions as a shining city on a hill of opportunity, openness and interspecies tolerance, and help to make that city a better place as a police officer. She would be the first bunny cop, and everyone from her parents to bullying local school peers to academy trainers tells her she is not cut out for it and would be foolish to even try. But Judy is smart, capable, determined, and greatly motivated, especially by the follow-your-dreams pop anthem “Try Anything” by superstar singer Gazelle (Shakira). She overcomes all of the doubt and obstacles to graduate at the top of her class and win an assignment to the Zootopia Police Department’s central precinct. What she finds there doesn’t accord with either her twice-as-good work ethic nor her lofty visions of altruism: she’s immediately busted to meter maid duty by the gruff, cynical water buffalo Chief Bogo (Idris Elba), confronted with the disdain of her fellow officers (many of whom feel her a token PR hire to the force) and citizens, and worn down by the loneliness of life in a new, big city. Even when she busts a flower bulb thief after a frenetic chase, she is not rewarded but is rather threatened with dismissal for overstepping her bounds, and only saves her job by striking a bargain with Chief Bogo to solve a missing mammal case that the ZPD brass seems to want no part of (the depiction of the internal department operations is far less realistic than, say, on The Wire, but this is ultimately a talking animal kiddie cartoon, after all). With 48 hours to find a missing otter or else turn in her cherished ZPD badge, Judy leans on a two-bit con-hustling fox named Nick Wilde (Jason Bateman) to help her scare up some leads. His snide dismissal and reluctance compelled aside by evidence of his tax evasion, Wilde aids Judy in gradually uncovering a shadow conspiracy to activate the savage killer instincts of Zootopia’s predator minority as part of a dastardly grasp for power. Their investigation leans on buddy-cop movie clichés and other genre conventions, but it also provides a wide-scope view of the world of Zootopia. The fantasy animal city is cleverly and spectacularly rendered and quite detailed, but also feels proscribed in its realization and the film’s exploration of the environment. Different ecosystems are represented in different neighbourhoods: Sahara Square is a parched desert, the Rainforest District all vines and towering jungles foliage, Tundratown an arctic waste, and small rodents live in their own bustling urban miniature enclave. Animals drive cars, use computers and cell phones, and wear clothing (with the exception of a commune of freaky-hippie nudists, whose lack of garments shocks Judy when she and Nick follow a lead there), but Zootopia frequently skims the creative surface with the real distinctions between human civilization and this anthropomorphic animal one, taking many of its features as simply assumed from the audience’s recognition of their own modern life experience. 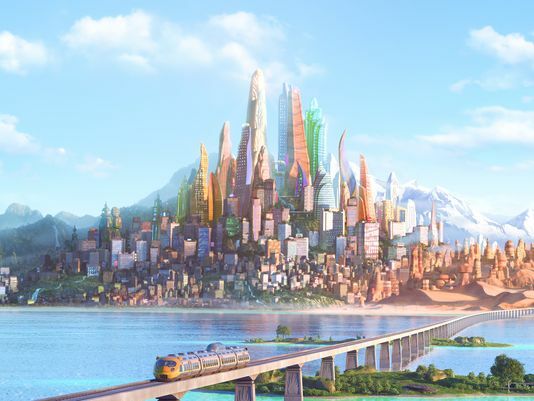 If the gleaming city-of-the-future design of Zootopia’s material reality can feel a bit underdeveloped, then its version of the unsettled set of social and racial relations of contemporary America is unnervingly tangible and topically relevant. Although the animal world’s primal divisions of predators and prey have, in Zootopia, been submerged under the lapping tides of capitalist democracy, consumer culture, and liberal tolerance, they simmer still beneath the surface. Judy’s parents distrust the city and what they perceive to be the dangerous predators who dwell there, and a not-insignificant portion of their fear transfers to their daughter. This fear stirs instinctually within prey animals in the city as well, despite constituting the vast majority of the population. So when a minority within the minority of meat-eaters begin to revert to their savage predatory state (raising the unanswered question about what they eat the rest of the time), widespread public panic amongst prey citizens, as well as hurt and resentment among the predators accused of returning to their repressed biological urges, is quick to manifest itself across the metropolis. This plot and its themes contain resonant echoes of America’s common currency of fear, paranoia, and racial prejudices and tensions. White Americans’ enduring bigoted stereotypes of African-Americans as dangerous predatory criminals are clearly being invoked, for certain (as are more recent blanket associations of all Muslims with extremist terrorism). The prey animals’ majority in the city is clearly stated at 90%, leaving the predator animals at 10%, conspicuously close to African-Americans’ 12% share of the U.S. population (though also reflective of the predator-prey distribution in the animal kingdom of our own world). Recognizable incidences of fraught racial prejudice are played for light-ish comic effect: when the chubby cheetah desk cop Clawhauser (Nate Torrence) coos that Judy is a “cute bunny”, she tentatively explains that other bunnies can call each other cute, but it’s problematic when other species say it; Judy and Nick first meet when the latter is running a con on an elephant sweets shop that attempts to refuse service to smaller species like foxes or rabbits. Judy Hopps is confronted with much of the casual discrimination and swimming-upstream difficulty that women and people of colour face in the workplace (especially in white-male-dominated fields like law enforcement), but it’s couched as being predicated on her species more than her gender. Less a glass ceiling than a grass ceiling, then. Her fellow cops are mostly larger, stronger herbivores: elephants, rhinos, and hippos, even a wolf on the undercover squad (you can guess what animal’s clothing he’s disguised in, I’m sure, but the joke is better-executed than you might expect). Nick Wilde, drummed into cynicism by a traumatic childhood experience of species-specific discrimination, likewise stereotypes Judy. He is stereotyped by her in turn, despite her best efforts at tolerance. Even if his slippery, untrustworthy fox identity hews close to the supposed archetype, Zootopia intelligently argues that he slips into a shifty existence as a defeated fulfillment of his peers’ insistence on labelling him as such. It isn’t surprising, given all of this thematic material, that Rich Moore is a co-director: he helmed Disney’s recent stand-out Wreck-It Ralph, another metaphorically sophisticated animated film about labelling and stereotypes and their relationship to the wielding of social and political power (the economic valence goes unsounded in both films; perhaps it’s a bit too much for kids, or even most adults). It’s well worth noting that Zootopia is far from pure and righteous in its critical stance towards the application and diffusion of ethnic, cultural, and racial stereotypes. It deploys some broad Italian-American stereotypes of its own when Judy and Nick meet Tundratown’s feared crime boss Mr. Big (Maurice LaMarche), who mutters like Marlon Brando’s Don Corleone and whose daughter sports a Jersey Shore artificial tan and a Snooki bump-it hairdo. It also needs saying, and has been said by other critics, that despite Zootopia‘s characters aghast reactions at the idea of predators being biologically or instinctually inclined to kill and eat prey animals, well… they are. For all of the liberties that the film’s cartoon animals allow its phalanx of writers to cleverly comment on prejudice and discrimination, the metaphor ultimately has its limitations as well. It’s also well worth noting, given all of these racially-toned themes, Zootopia‘s place in Disney Animation history. Or, more precisely, its place as a ritual of atonement for that history. Disney’s use of cartoon animals to self-consciously argue against racial stereotyping in Zootopia can only strike one as a purposeful if belated effort to apologize for, mitigate, or even invert the studio’s historical use of cartoon animals to insensitively spread racial stereotyping. The infamous rosy-glasses view of Reconstruction and minstrel show characterizations of Song of the South (whose perceived racism has kept it locked in Disney’s vaults to this day) are the best-known indiscretions in the studio’s history, but Dumbo‘s jive-talking crows and even the more contemporary Aladdin‘s clumsy Arabic bigotry must be acknowledged in the litany of shame. Zootopia has its own issues in this vein, as noted, but it’s both a stab at forgiveness for past errors of prejudiced judgement and a heartening attempt to move forward into a more conscious representational future. When it’s said that popular discourse would ideally avow responsibility for past wrongs and work intelligently and openly to forge a better path, Zootopia is what that process looks like, and for that it deserves no small measure of credit. While I obviously can’t speak to how Zootopia would play to children (seeing as I am not one, appearances aside), it plays like gangbusters for adults who will recognize the cornucopia of social, political, cultural and professional gags and references it unleashes with cheery humour. Indeed, the movie pushes the standard contemporary animated feature film undercurrent of witty, sophisticated jokes and adult-oriented hat-tips about as far as it can go. Zootopia is definitely the only PG–rated Disney animated feature that has ever included a scene in what is essentially a meth lab (and with an overt Breaking Bad reference to cinch the association), or to craft a painstaking visual homage to The Godfather, or to create a hilarious sequence combining persistent jokes about the sloth’s pace of DMV bureaucracy (staffed, in Zootopia, by actual sloths, natch) with a classic 1950s comedy routine. This, in addition to the aforementioned spectrum of sociopolitical and racial issues it nimbly raises and addresses as well as the delightful craft and glee with which it was made, makes Zootopia a strong highlight in a year of strong highlights for the House of Mouse.